This is part two of a two-part series on cereals: If you haven't already, please see part one: Just Say No to Overpriced Boxed Cereal. In my prior post, I discussed the various offensive marketing techniques that cereal manufacturers use in their efforts to maintain high prices. Today's post will suggest ways for consumers to fight back. This first tip is simple and instinctive for many frugal grocery shoppers, but it serves three non-obvious purposes. First, it will help you compare cereal prices fairly across brands sold at different weights. 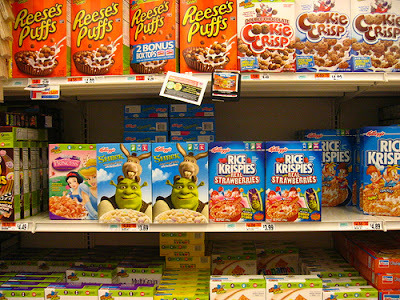 Second, it exposes just how preposterously expensive most cereal brands truly are. Third, you'll catch any and all examples of stealth price hikes. First, look at the net weight number on the front of the box, and do the math on how much you are actually spending per pound of food. Remember, a 12-ounce box of cereal priced at a seemingly acceptable $4.99 really costs $6.65 per pound. That $6.65 could instead pay for 3 dozen eggs, or, shockingly, 13 pounds of generic oatmeal. You can get much more value for your money on almost any other breakfast food, a subject we'll address in a moment. But the most important benefit by far from paying attention to the net weight information on cereal boxes is that you'll never again be tricked by a sneaky stealth price hike. But why stop at just noticing a stealth price hike? Why not punish the cereal maker with instant retribution? From now on, whenever you see a company pull this stunt, punish them right then and there by not making the purchase. If there's ever a time to drop a product and change brands, it's immediately after a stealth hike. I believe that we have an obligation as consumers to vote with our wallets and show food companies that they will lose sales and market share for using ethically questionable pricing techniques. Food manufacturers are required to list all ingredients in their foods in order of their preponderance. Thus if you see sugar, high-fructose corn syrup or any other sweetener in the first two or three ingredients of any cereal, just put it back on the shelf. You're better off eating real food. The same goes for salt/sodium chloride. And if you think it takes too much time to scan ingredient lists while you're in the grocery store, keep reading. At the end of this essay, I'll give you two examples of how, in just seconds, you can extract valuable information from any ingredient label. That's time well invested in my view. We've talked in Part 1 of this series about how our youngest consumers are often least able to defend themselves against well-crafted marketing and advertising. And many parents will tell you that children can be shockingly brand-conscious. That's why, unfortunately, it's often a really good investment for cereal companies to spend large sums of money to advertise directly to children (this logic holds true in the toy, clothing and media industries as well). Once again, we can vote with our pocketbooks and simply not buy these products. When companies recognize that it will cost them profits rather than earn them profits by marketing aggressively to children, they'll change their behavior. And perhaps then we'll have a healthier, less consumerist generation growing up behind us. There is a virtual infinity of breakfast foods available to us, ranging from healthy and laughably cheap oatmeal to perfectly boiled eggs to breakfast burritos, to fresh fruit and yogurt. Eggs are a particularly good example of a healthy food that can be endlessly varied, and at around $2 a dozen you can eat up to 15 breakfasts for the price of a single box of cereal. Here are some more ideas for cereal substitutes: simple bread and cheese; two or three pieces of fresh fruit, bagels with toppings of your choice, smoothies, simple energy-dense meats or sausages, cold cuts with or without bread, etc. Heck, even cold pizza can be a satisfying breakfast food on occasion. And there are still more reader suggestions for alternate breakfast foods in the comments section of yesterday's post. Every single one of these breakfast food ideas is significantly cheaper on a per-calorie and per-pound basis than branded boxed cereal, and not a single one of them will give you a sugar high or make your teeth hurt. In the political area, the term "swing voter" refers to voters who are willing to vote for either party, depending on the issues or the candidate. They are the most coveted of all voters, and they tend to get the most attention--and concessions--when election time rolls around. I want you to think of your consumption patterns in exactly the same way. Consumers are rarely rewarded for mindless loyalty, and for those consumers who are willing to "swing" from brand to brand, there are all sorts of deals and incentives out there. Every company in the food industry wants more market share, and many will dangle juicy incentives in front of you--including coupons, buy one get one free deals and other enticements--to get you to try their products. Why not take advantage? If you see an attractive incentive for an alternate brand, try it. You might like the product even more than your regular brand, and if it's cheaper, so much the better. Obviously you can't do this simultaneously with all of your product buying decisions, or your weekly grocery trips will end up being day-long exercises in decision-making. And I never encourage using coupons as a reason to buy food products you don't need. But each week, why not grab one or two of those juicy, dangling incentives and see if it introduces you to a better and cheaper version of something you already buy? (NB: For further reading on how to grapple with the dizzying array of choices available to consumers, I highly recommend reading The Paradox of Choice by Barry Schwartz). In politics, it's the swing voters who often carry the day in a competitive election. In the ultra-competitive food industry, the same could be said for swinging consumers (and no, I don't mean that kind of swinging). Readers, what other suggestions do you have to fight back against the cereal cabal? 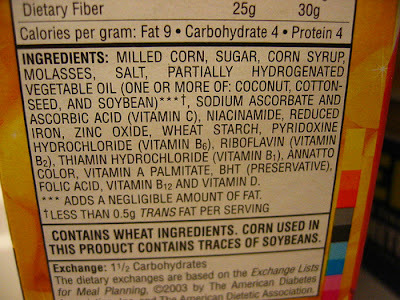 I'll close this post with two photos of cereal ingredient lists and a brief demonstration of how you can extract valuable information from these lists with just a quick glance. Remember, the higher up an ingredient is on the list, the greater its prevalence in the food, so all you really need to do is read the first four or five ingredients. If you're not happy about the nature of those four or five ingredients, you won't be happy with most of what's in the cereal. Thus it takes just a few seconds for you to extract all of the information you need to make a highly informed buying decision. Shockingly, the first ingredient isn't sugar. But the next two ingredients are sweeteners, and the fourth ingredient is a thickening agent. It's not until the fifth ingredient, cocoa, that we arrive at what is more or less an actual food. Other than that, it looks like salt, anti-caking agents and artificial flavors dominate the remainder of this ingredient list. Yummy. 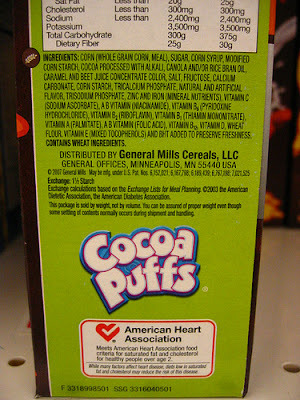 Oh, and did anyone notice the irony of Cocoa Puffs receiving a seal of approval from the American Heart Association? Here, our second, third and fourth ingredients are all sweeteners. Followed deliciously by salt. Put this box down and slowly walk away. Really interesting cereal discussion ... both posts and the comments. I rarely eat cold cereal because, nutritionally, I don't think its a good bang for your buck. Too much sugar, and it rarely satisfies by keeping one full. By far I prefer unsweetened oatmeal, usually steel cut oats, or yogurt, fruit and nuts for breakfast. Between the oatmeal, yogurt and eggs, I couldn't tell you the last time I had a bowl of cereal. It just doesn't stack up the way these other foods do ... monetarily or otherwise. So I will concede that I do eat cereal, not for breakfast, but as a snack on occasion. Now that you point out that I am paying more a pound for it than meat...I will seriously reconsider. I mean, if I'm not paying for lamb just because it's too expensive per pound then why I am I willing to pay for cereal? Good question, I just never thought about cereal that way before. I really enjoyed this series of articles, thanks for posting! Great post, I was just in our local market the other day and a regular sized box of shredded wheat (plain, not frosted) cost $4.39!!! I couldn't believe it and didn't buy it because I knew the other store had it for less. Cereal prices are outrageous, I love my cheap oatmeal. Great post. Cereal is such a rip off! and so few are actually healthy. I buy rolled oats in bulk and use that as my breakfast cereal ... but it is hard sometimes to beat the convenience of the cold, boxed cereals. And when I'm really on top of things, I make my own granola, which is 100 times better than any boxed cereal. Cost effective, too. A comment about the labels pictured. I can tell without even reading them that I don't want that product. It's the length, too long, too many ingredients. In my mind, that cannot be good. It's been so long since I've last had cold breakfast cereal that, even though I can now have it again after forcibly whacking my blood sugar into shape by biking thousands and thousands of miles, I don't want it. Especially compared to the joy that comes from having oatmeal on even days and sausage-egg-cheese-toast sammiches on odd days. What a well-written and timely series, Dan. I've been thinking more and more about cold breakfast cereal now that the weather is changing here in Central NY. Usually I prefer hot oatmeal, a hard boiled egg or small sugar-free yogurt with fruit. Boxed cereal is just too darned expensive for what it is: too little nutrition, too much sugar. Recently, however, I made a batch of homemade granola using sugar-replacers that helped it fit into my diabetic lifestyle. Although it, too, is a bit on the pricey side to make (about $5 for a batch), the whole mess makes the equivalent of two boxes of store-bought, which run at around $4 each. Plus I can eat cold cereal again, which is a nice change and helps me get more calcium from milk. I'm really glad people are enjoying the discussion and are getting good value out of it. The one thing about boxed cereal is that it's really convenient. But the cereal industry is damaging their credibility with too many years of stealth (as well as actual) price hikes and too many sugary/salty ingredients. I'm grateful for all of the alternative breakfast suggestions. I have the best readers! Hi Dan - two excellent articles on cereal. We have the same problem here in Australia with manufacturers reducing the size of their product (eg cocoa is one that springs to mind) but keeping the costs the same. I haven't bought breakfast cereal for a long time, mainly because they are so sweet and have so many additives and processed stuff in them. Porridge, home-made muesli or granola with yogurt, scrambled eggs, toasted coconut bread, homemade muffins, buttermilk pancakes ... there's so many wonderful breakfast dishes that are so easy to whip up, that I just can't be bothered with processed cereal. Keep up the good work! PS - I've just posted about "cookbook exploitation month" - it was so much fun! Thanks for coming up with such a great concept. Cheers! Hi Melinda, thanks for reading and commenting. I'm sorry to hear that stealth price hikes happen in Australia too--it's just doesn't seem sporting. I just came across this post today (and the previous one on cereal) but wanted to say, you've given me a lot to think about. I really am addicted to my cereal (could eat it for every meal...) and you've put into sharp focus why that's so bad. I try to be a fairly healthy eater but I have to admit I never paid much attention to the ingredients in my cereals. thanks for the wakeup call... now to see if I can actually break the habit!! Hi Rebecca, thank you for the feedback, and I'm glad I gave you something to think about. Anytime I give a reader a wakeup call, I feel I've done a good thing. Good luck breaking the habit! Incredible article. I really never thought about cereal this way. I will say this though: I love cereal and don't think I can give it up. But I will hunt relentlessly for a cheaper and healthier brand. Thanks for this article!